Does Project Management really need to be Gantt charts, Earned Value Analysis, PERT, and resource allocation? Is enterprise project management software the only option? The PMI, PMBOK approach works for some project managers. It's how we started. But, we quickly learned this approach is overwhelmingly cumbersome for smaller companies. Too much time is spent managing projects and tasks, and not enough time actually getting the work done. We went with a different approach for easy project management. We call it Predict, Track, and Learn. Intervals hits that sweet spot, the one between the over-simplified app that does very little, and the complex enterprise app that no one wants to use. Because project management software should be both simple and powerful. Managing and tracking your team’s efforts requires more than just time and task tracking features. 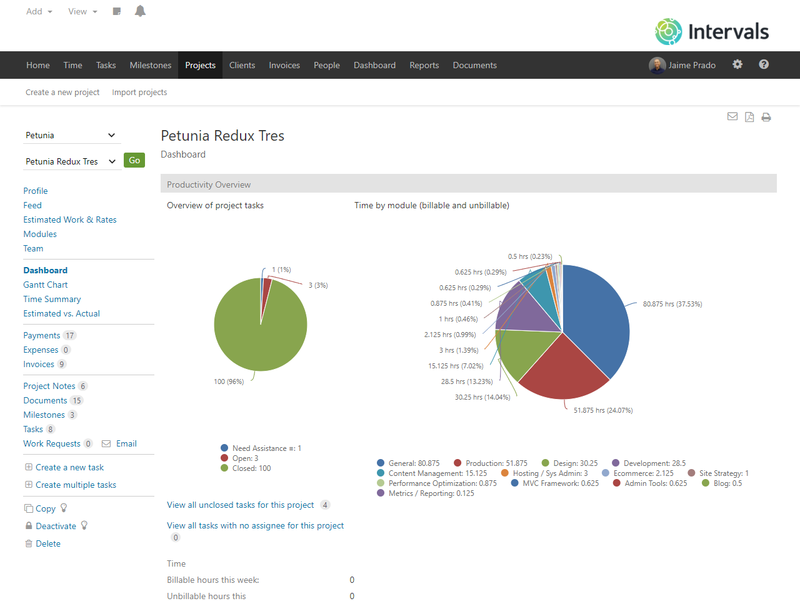 Intervals provides simple and powerful project management tools you can actually use — project budgets and estimates, real-time graphs, detailed reports, and visual dashboards. Is our team being maximized? Are we over budget yet? What the heck have I been working on? How much work did we get done this week? How much time did my subcontractor spend this month?